Uithoorn, 7 October 2013 – The maritime world is a living legend richer with the launch of the Riva Aquarama Lamborghini, which has been fully restored to its original condition. Built 45 years ago for and commissioned by Ferruccio Lamborghini, founder of the superb Italian sports car brand, the fastest Aquarama in the world is once again ready to cast off. A splendid piece of maritime and automobile history has been restored. For years the runabout was stashed away in the corner of a boatyard, hidden under old tarpaulin and above all, hidden from the world. Enthusiasts were aware of the existence of Ferruccio Lamborghini’s Riva Aquarama, but didn’t know where the legendary sports boat was after its owner passed away in 1993. That is not until a Dutch Riva collector tracked it down and had it fully restored to original condition by Riva World, a world-renowned specialist in the restoration of Riva boats. Now in 2013, three years after restoration work on the Aquarama Lamborghini began, the boat is back to life in all its splendor and magnificence. Riva World didn’t accomplish this overnight. Sandro Zani, owner of the well-know Dutch Riva restorer, travelled to Italy on a regular basis during the past three years, including visits to the Ferruccio Lamborghini Museum, in order to document all the details and elements of the original, before beginning the extensive restoration. The project took around three years in total, during which the Aquarama was returned to its original condition from top to bottom. The wooden hull was repaired, sanded and no fewer than 25 coatings were applied. The wooden interior was repaired and the seats were reupholstered in the famous Riva design; all buttons and switches were disassembled, repaired and reinstalled; all chrome parts shine again like new and… naturally Lamborghini’s Riva received a new beating heart. A heart that makes this one-off from the past the fastest Aquarama in the world, thanks to beautiful twin Lamborghini V12 engines from the very first Lamborghini ever created: the 350 GT. Another valuable source in that area was Lamborghini’s former legendary test driver and developer, Bob Wallace, who sadly passed away not long ago. He provided the Riva World team with input for getting the two Lamborghini engines ready for maritime use, for the conversion of the engines so the one would rotate to the left and the other to the right, for increasing the torque at low revs and for the manufacture of unique parts. The result: two wonderful sounding Lamborghini 4.0 V12s, each with 350hp and equipped with six twin Weber carburetors (twelve in total) with a rev range between 700 and 5,000 rpm and a formidable torque that through various adjustments to the engines, including increased bore and longer stroke, is already available from around 1,500 revs. Together they give the Riva Aquarama Lamborghini a top speed of around 48 knots, compared to 40 knots for regular Aquaramas that Riva fits with twin V8 units as standard equipment. 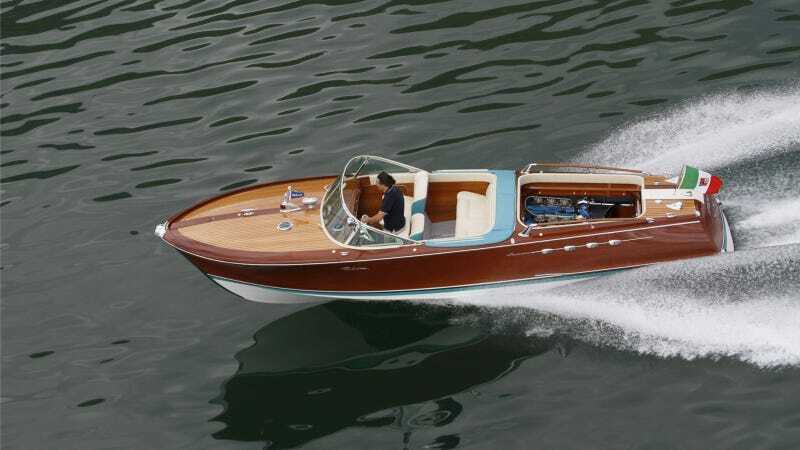 After a few test runs in the Netherlands, last summer the legendary Riva was transported to Italy, where like a fish in the water the sports boat was given free rein on Lago d’Iseo. Also under the watchful eye of Carlos Riva, father of all Riva fathers, the founder of the brand and the man who back in 1968 was himself urged by Ferruccio Lamborghini to build the Aquarama in just three months’ time. With the completion of the restoration of this unique one-of-a kind Riva Aquarama Lamborghini, Riva World has brought a legend back to life. The result is a magnificent collector’s item that knows no equal in terms of restoration level and workmanship and with which Riva World will once again thrill maritime connoisseurs as well as lovers of hot-blooded Italian sports cars. You can watch a video of the Riva Aquarama Lamborghini here.